Keep the sun off your face, your hair in place and add a little style attitude all in one. 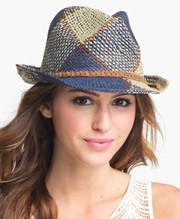 A straw fedora works with practically all casual relaxed looks, at the beach and pool and in the city. Plus, the plaid weave pattern on this charming little number is sure to add some patterned pizzazz to your outfits. Also available in Julius.